Stock these at-home bars in your shower and drink in the skin soothing benefits of wine-turned soap. Even if Sunday brunch is a whole week away, you can still start your day with a refreshing splash of (soap) bubbly. 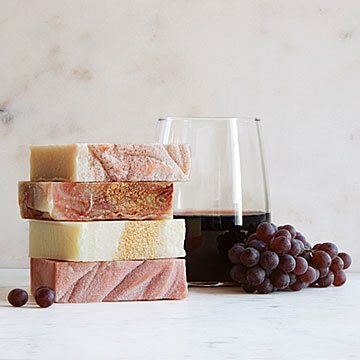 Stock these at-home bars in your shower or tub and drink in the surprising skin soothing benefits wine-inspired soap. To craft these all-natural vegan soaps, Heather Swanepoel blends notes from popular red and white wine varieties with complementary scents and oils—such as citrus for "chardonnay" and berries, plums, and apples for "pinot noir"—resulting in a series of sublimely scented soaps that bear the distinctive shades and subtle fragrances of the vinos that inspired them. Redolent with the rich, layered notes one would expect from any full-bodied bottle, this effervescent collection is just the thing to turn your day-to-day wake-up routine into happy hour. Handmade in Monroe, Georgia. Cut your soaps in half to promote longevity. When not is use, allow your soaps to breathe (do not wrap them in plastic, put in a resealable container, or be in the constant flow of water); the longer they dry, the longer they will last. Each soap contains saponified oils of: Olive, Coconut, Palm Kernel, Cocoa Butter, Shea Butter, High Oleic Sunflower & Refined Sweet Almond along with Fragrance. Truly beautiful product and a great price considering. They smell SO good, I can't wait to use them! Its really unfortunate that a few folks are complaining about such minor issues with the packaging. I'd definitely recommend these as a unique gift for anyone, especially a wine lover. Loved the look and moisurizing properties of the soap. Made great gifts! It's a perfect way to start a day or finish a day. Helps the body smell beautiful and clean all at the same time. Bought is as part of a "relaxation" set for a friend's birthday. She LOVED it. I'm expecting positive reviews from the recipients as I feel it was a unique gifting, and as I said, they smelled wonderful and they are very pretty--looks like you can even eat them! To treat her. The scent is great, and the soap itself feels great. I did not use the product as it was a gift. But it was packaged nicely and is super unique and surprising. Excellent choice for a wine lover!